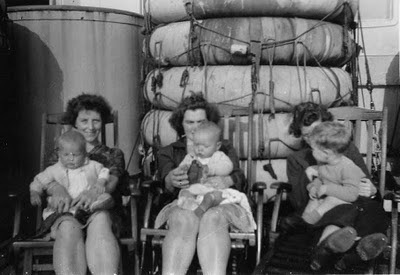 Ian Munroe and his mother Frances (centre) on board the Queen Mary, June 1946. All Ian Munroe wants is his Canadian citizenship. 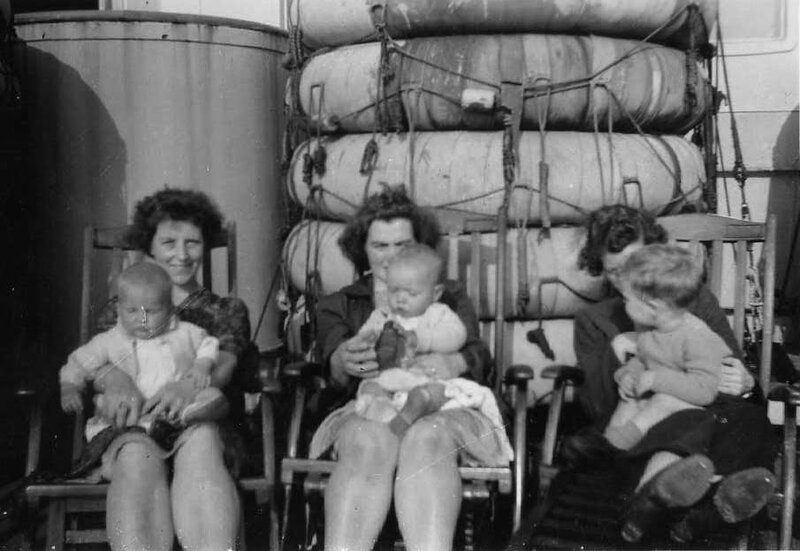 The 65 year-old Scottish-born son of a war bride and a Canadian Second World War veteran has lived in Canada since June 16, 1946, when he and his mother Frances arrived at Halifax's Pier 21 on board the Queen Mary. Ian grew up in Nova Scotia, went to school, worked, paid taxes and voted in elections. He even served in the Canadian Navy for 18 years, leaving with an honourable discharge in 1985. He never had cause to think about citizenship until the day nearly 25 years ago when he found out he wasn't Canadian. Ian's problems began when he applied for a passport. As a member of the Canadian navy, he had travelled the world - but because he was in the Forces, a passport was not required. Now that he was a private citizen, he needed one. "Imagine my surprise!" says Ian, of finding out he was not a citizen. "I'd been here since 1946, was married to a Canadian, my mother and father were both Canadians, my children were all Canadian, my brother was a Canadian, as were all my cousins on this side of the ocean. I'm the only misfit." Luckily, the person working at the passport office issued Ian temporary documents and advised him to apply for citizenship, but Ian didn't have any plans to travel overseas, so he didn't follow up. Then 9/11 happened and the U.S. tightened security measures at the border. In 2007, Ian's best friend, who lived in Maine, was dying, but Ian couldn't get a passport. "I couldn't even attend the funeral," he said. By this time, Ian was approaching age 65, retirement and pension. Ian was told the best he could get was Permanent Residence Status, which is reserved for immigrants. "I'm a Canadian. I'm not an immigrant, but I had no choice. I need my pension." So Ian applied for Permanent Resident Status. Problem is, it doesn't guarantee a passport. Then, in April 2009, the so-called "Lost Canadian" provisions of the Citizenship Act were enacted and war bride children like Ian finally believed they had a chance at citizenship. But as Ian soon found out, theory and practice are two different things: the CIC website is confusing and the call centre in Sydney, Nova Scotia no better. Frustrated, Ian wrote to his MP, Gerald Keddy, Prime Minister Stephen Harper, and to Citizenship and Immigration Minister Jason Kenney. "I received a phone call from Mr. Keddy's office last February and they told me I had to fill out some forms at CIC and pay $400, but it would take up to 16 months for an answer. "After that, I said to heck with it. I've received no response from Jason Kenney or Stephen Harper and I'm seriously thinking about getting my British passport if this doesn't get resolved soon," he says. Over the last year, Ian has written letters to the editor of the Halifax newspaper and he even appeared on Canada AM, which led him to the Lost Canadian organization. Last month he was on the international radio program Voice America with Don Chapman, leader of the Lost Canadians. This week, with the help of the Lost Canadians, Ian untangled the forms on the CIC website and found out that all he has to do is apply for his Proof of Citizenship, pay $75 and wait four months for his citizenship card. Then he can get his passport. He's feeling better, but wonders how many other war bride children have given up. "There have been times when I felt completely hopeless and let down," said Ian. "It really hurts when you don't belong." Melynda Jarratt is a Fredericton historian of Canada's war brides and works with the Lost Canadian organization.